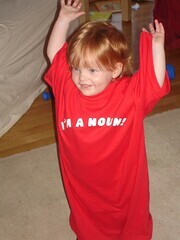 daily fiona: Fiona is a noun! trying on Daddy's sweet new Threadless shirt. But not just any old noun, Miss Fiona. You're the most important kind of noun: a proper noun!